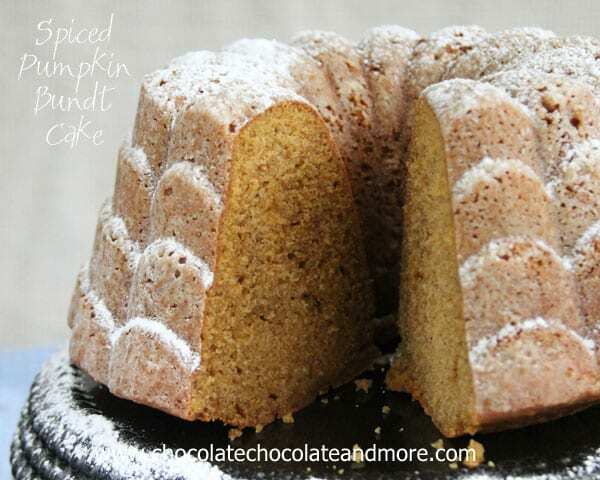 Kahlua Cream Pumpkin Spice Torte - Chocolate Chocolate and More! 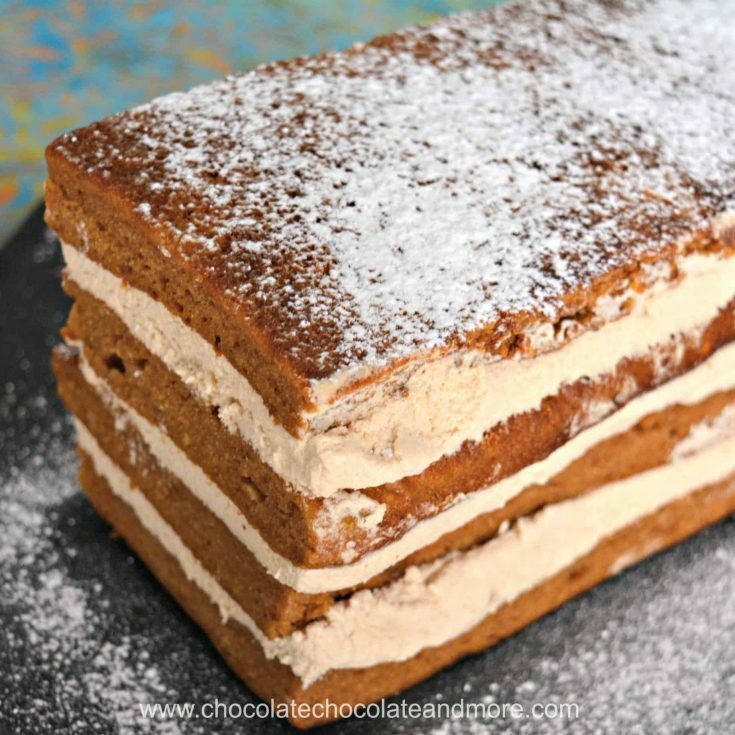 Kahlua Cream Pumpkin Spice Torte – pumpkin spice cake with Kahlua cheesecake filling – starts with one cake that bakes up in 15 minutes. Did you know that many canned baking goods have recipes on the inside of the label? Just before Thanksgiving I tried the pumpkin cake roll recipe on the inside of the Libby’s pumpkin label. I thought, if Libby’s is promoting it on the back of their label, it’s probably a good recipe. Right? All I need to do is dress it up a little for the holidays. Believe it or not, Kahlua goes amazingly well with the pumpkin spice. If you don’t want alcohol, replace the Kahlua with sweet coffee. Well, this cake roll didn’t work for me. The cake is too thick and heavy to roll properly. 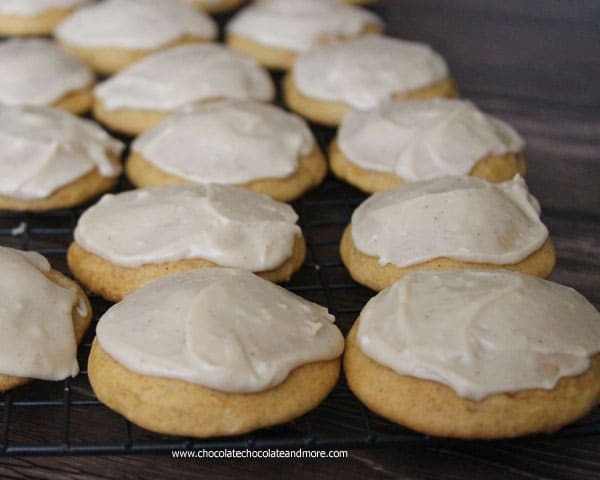 The cream cheese filling was also difficult to get to the right consistency. On my first attempt the filling was too soft so it just squeezed out of the cake (as the cake cracked). So I chilled the filling before spreading on the cake. With the heavier filling and difficult to roll cake, I ended up with a tube of filling in the middle of a circular cake. I really liked the flavors and so did my colleagues. They didn’t mind that the filling was a blob in the center. They raved about the taste. So how to salvage a thin cake that doesn’t roll? Stack it. The problem is the cake is thin (about 1 inch thick). Putting filling between just two layers of this cake looks like you’re trying to salvage something that didn’t work. 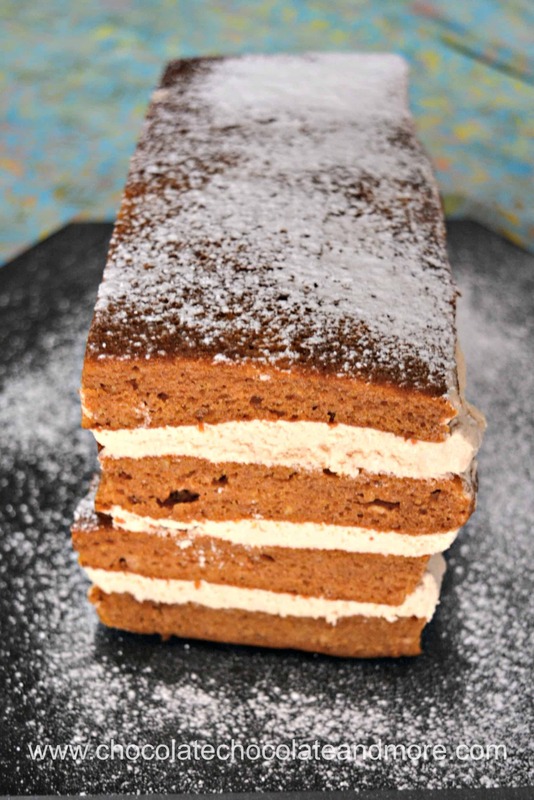 But four layers, a Kahlua Cream Pumpkin Spice Torte. Now that’s impressive! I doubled the cake recipe and baked it in a half sheet jelly roll pan (large cookie sheet with sides). Then I cut the cake into 4 rectangles, spread filling on two of the rectangles and topped with the other two. Basically pumpkin bread sandwiches. I spread the last bit of filling on top of one of the two sandwiches and refrigerated. This let the filling firm up so the bottom could support the weight of the upper layers without squeezing out the filling. 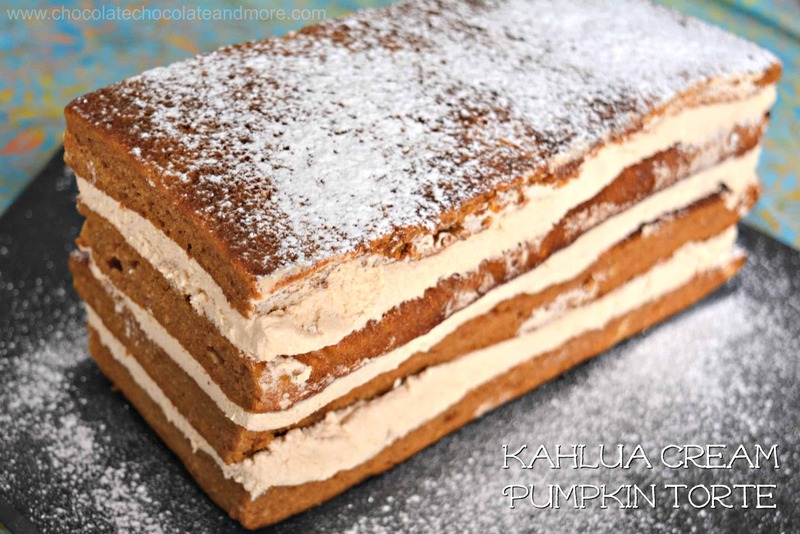 Thoroughly chill the Kahlua cream pumpkin torte before serving so it will slice nicely. The Kahlua cream cheese filling is very rich so I just dusted the top of my Kahlua cream pumpkin spice torte with some powdered sugar. You could put less filling between the layers and top it with some of the filling. Or you could dress it up with a little whipped cream. If you’re pressed for time, spread the filling on top of the cake before you slice it. Chill and then slice it into bars. Preheat oven to 375°F. Line a half sheet jelly roll pan with parchment paper and lightly oil the top. I put a couple teaspoons of cooking oil on top and spread with my fingers. Put all cake ingredients in a bowl and blend until smooth. Spread in prepared pan and bake for 15 -20 minutes. Let cook a few minutes in pan and then turn out onto wire rack to cool completely. Cut the cake in half (you will have 2 squares) and then cut each square in half again to get 4 rectangles. Blend butter and cream cheese together. Blend in powdered sugar and then slowly blend in Kahlua. I used a large cookie sheet for this. Place one of the rectangleson a cookie sheet. Spread about 1/3 of the filling on top. Top with another rectangle. Place the third rectangle on a cookie sheet. Spread 1/3 of the filling on top and top with the fourth rectangle. You now have two sandwiches. Spread the last of the filling on top of one of the sandwiches. Refrigerate 30 minutes to stiffen the filling. 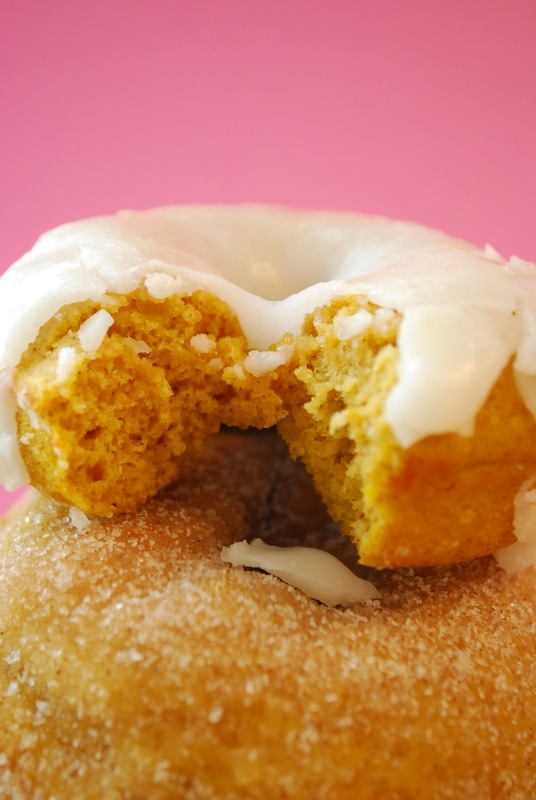 Looking for more pumpkin spice goodness?